Nothing beats the stain of a juicy marker tag. Or does it? This question used to be easy to answer, until the invention of the EGGSHELL sticker. Getting up with stickers is not only a clean way to share your name, it is often discrete and draws less attention during application. You can prepare a sticker with as much, or as little effort as you please using your favorite marking tools on them such as Montana BOLD markers, Montana ACRYLIC markers, Montana Permanent Short or Montana Sketchliners. We are happy to announce the availability of the new Montana EGGSHELL sticker, white. These high quality, 120mm x 70mm stickers come in packs of 50 pieces. A beautiful, timeless, white eggshell sticker base with a discrete grey boarder is the new home for your hand styles. Eggshell stickers deteriorate into flakes when trying to remove them. Often allowing most of the sticker to remain on the surface it was stuck to. An ideal way to get attention amongst the noise of urban calligraphy. 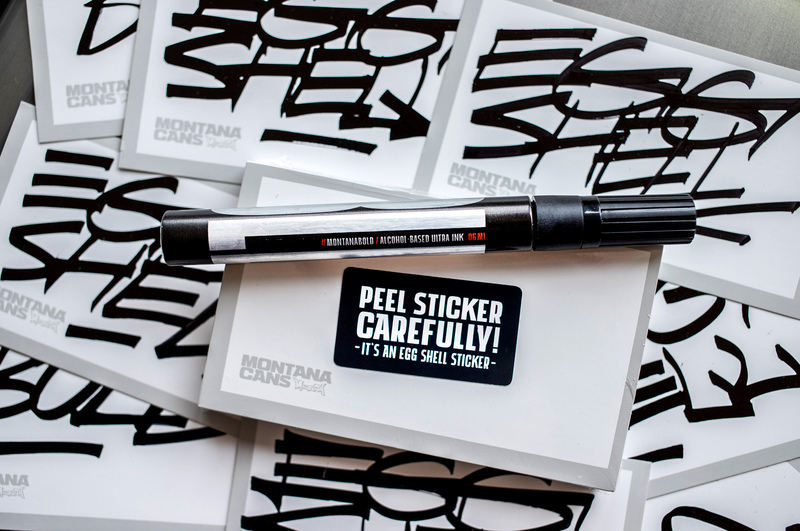 Regardless of if you call it sticker bombing, slaps or stick-ups, get your markers ready and go visit your local Montana Cans reseller now and try them for yourself.